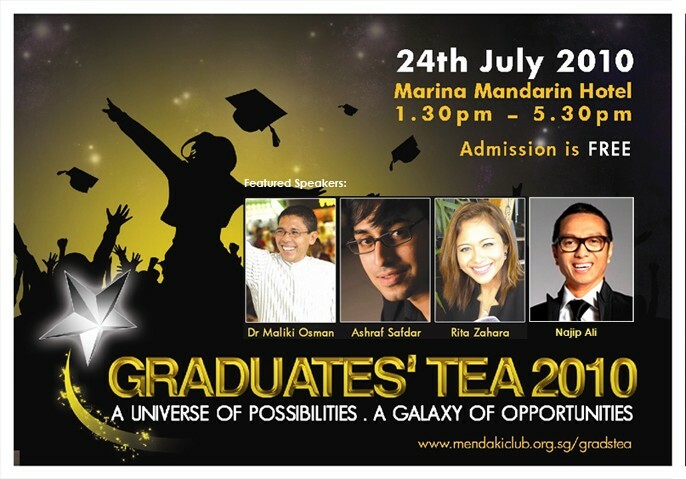 Calling All Malay/Muslim Graduates of Graduating Class 2009 and 2010! Graduates' Tea returns on Saturday, 24 July 2010, with the theme of "A Universe of Possibilities, A Galaxy of Opportunities". Graduates' Tea 2010 will be graced by Dr Yaacob Ibrahim, Minister for the Environment and Water Resources and Minister in-charge of Muslim Affairs. If you are a local or overseas graduate of Class 2009 and 2010, congratulations on your recent graduation! This event has been designed with YOU in mind, explore the site for more information on how to seize the opportunities presented to you upon leaving your alma mater. Grab this opportunity to create networks with other young and ambitious graduates like yourself, hear and learn from the experiences of established young professionals in the industry and pick up skills that will be invaluable for the next few years of your career!